Reid’s Heritage Homes is delighted to announce the opening of an exquisite new model home at Lora Bay. Like all of the unique homes in this luxurious community, this newest model is the creation of renowned designer and homebuilder Steve Garrow, who partners with Reid’s Heritage Homes in this community in the heart of this Ontario four-season playground. Lora Bay is in a prime location in Thornbury, only minutes from the year-round attractions of Georgian Bay and the Blue Mountain region, and surrounded by the championship Golf Club at Lora Bay. Garrow is proud of his new “contemporary design”. He says that before putting pen to drafting paper, he listened intently to “what people are asking for… and they are looking for a high end ‘condo’ look, built into a home. Our homes are designed for entertaining.” The fact that many Lora Bay homeowners request personalization such as unique, artwork-like wine cellars is clear evidence of that reality. 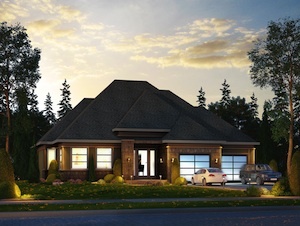 At the same time, the involvement of Reid’s Heritage Homes, one of Ontario’s leading homebuilders, means that each of the unique Lora Bay homes incorporates the RHH commitment to quality and environmental responsibility. He says that people who have moved to their new home at Lora Bay discover that they make more friends in their first two weeks in the community than they have in decades in their former GTA neighbourhoods. Lora Bay is proving a popular location both for year-round residents and for folks from the Greater Toronto Area who love their week-end getaway home. Reid’s Heritage Homes and Steve Garrow have created eleven homes at Lora Bay in the past year. There are currently 30 lots available for new home owners. Garrow says he loves the opportunity to work with new homeowners, and that his greatest joy is “the smile on the homeowner’s face when we give them the key”… to their unique and beautifully designed new home, in the unique and vibrant community of Lora Bay.